Last Friday and Saturday, Scotch ‘n’ Soda’s sketch comedy group Tisbert premiered their Fall show — “TisTalks.” The hour-long show was entirely student-written, produced, directed, and of course performed. I was impressed by the list of ten-plus student writers in particular, which left me wondering who wrote what and how the collaboration process worked. As you might guess from the title, the gimmick of TisTalks was Ted Talks, the nonprofit and global phenomenon devoted to “ideas worth spreading.” When the lights went down in Porter Hall 100, the half-full audience broke into cheers, excited for what was to come. The show began with a slideshow — a masterpiece of Windows Movie Maker, no doubt — featuring stock photos of flowers and promising inspiring talks on “your ex,” “why are the bees disappearing?” and “things.” Apart from the projector, which would make several memorable appearances, the other Ted Talk staple was a series of lecture-style monologues every few sketches, one for each of the five performers. These were generally a refreshing way to break up the sketches and prepare the audience for more. The show’s use of props (especially the projector) could only be called minimalist, which worked surprisingly well. The best jokes were able to shine through without fluffy distractions, and the few props that were used formed the centerpiece of their own sketches. Incidentally, my favorite monologue — and undeclared first-year in the College of Engineering Grant Seastream’s best performance of the night — was a TisTalk from the founder of a German design company that constructs everything out of cardboard boxes. The secret of their building material is so well kept that you’ve never heard of the company, and that’s the way they like it. Seastream demonstrated some of the company’s designs with his own cardboard box, which became a glove when he stuck his hands in it, a hat when he put it on his head and, when he stepped into it, a “small boat.” He displayed more complicated designs on the projector, including an image of a struggling neighborhood his company had totally rebuilt — again, with cardboard boxes. I’ll admit that the first monologue — a female Fortune 500 CEO telling the long-winded, nonsensical tale of how she got there — was fairly underwhelming. The “parents meet the girlfriend” sketch that followed it was downright cringe-worthy. I’m sure plenty of rednecks would’ve taken offense at electrical and computer engineering masters student Darrin Willis’s over-the-top “Prospector Betty,” who walked like she had a horse between her legs and proudly asserted to her boyfriend’s posh parents that she was a gold-digger, just not in the way they feared. This sketch was too dependent on played-out “hick” stereotypes and, in the end, not all that funny. After a fairly disappointing start, the quality of the sketches improved and hovered at a consistently entertaining level through the rest of the show. A sketch lives and dies on its seed premise, so it makes sense that the show was often hit or miss. Sketch comedy often is. The weakest were those that relied too heavily on crass, obvious humor, such as a sketch where the whole joke was a professor with a lisp and another where a family game of charades was ruined by the older brother’s sexual interpretations of supposedly “innocent” clues (“That’s f***ing! That’s obviously f***ing! I’m done!”; “That’s inappropriate, Timmy! Your sister is obviously acting out The Lion King!”). Meanwhile, the best sketches of the night were clever, simple ideas colored in with details and dragged out to their highest potential for absurdity. Both of my favorites featured senior business major Mya Snyder, the only woman in the cast, who consistently developed unique, convincing characters. The first was the “Never Have I Ever” championship between the most inexperienced shut-ins of the world: Snyder’s wiggly-fingered, crazy-eyed incumbent; undeclared Dietrich first year Philip DeCicco’s love, peace, and flowers cult member; and Willis, a stone-faced sociopath who “literally lives under a rock.” The “why hasn’t anyone thought of this” premise and strong characters (DeCicco and Willis’s strongest) made this sketch, which — predictably — ended with Willis’s character viciously taking Snyder down (“Never have I ever won the ‘never have I ever’ championship”). Another memorable sketch featured the mugging of that eerily familiar pretentious hipster whom you’d be kind of happy to see mugged, again played by Snyder. David Frank’s best moment arrived in the “Feelin’ the Burn with Bernie” sketch. I’d never before known how much I wanted to see our presidential candidates go head to head via ‘80s-style workout videos. 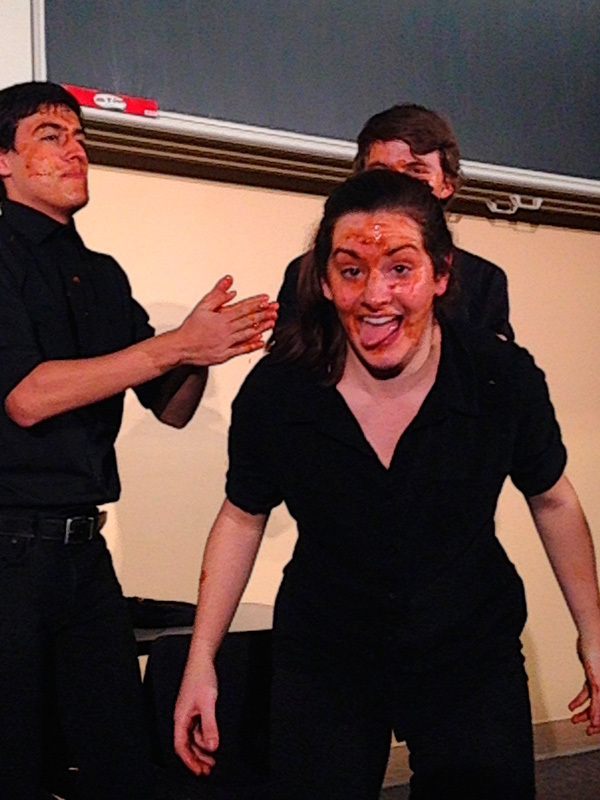 Despite a few misses, TisTalks was an entertaining hour of student-run and written sketch comedy. The cast members fully dedicated themselves to even the weaker spots of writing, and I was reminded how funny collaboration and a lot of enthusiasm can be. Correction: An earlier version of this article incorrectly referred to masters in electrical and computer engineering student Darrin Willis as "Wilson."